The thymus secretes a family of polypeptide hormones that act on the structures and functions of the cellular immune apparatus, such as the maturation of T-cell precursors into fully competent T-cells (J Immunopharmacol 1979;1:277-310). Thymus function declines with age, correlating with atrophy of the gland itself, and with the progressive, age-related loss of normal immune regulation (Clin Exp Immunol 2001; 125:409-13, J Clin Immunol 2000; 20: 250-6). Controlled clinical studies demonstrate that oral thymus supplements can have optimizing effects on immune function (Pediatr Med Chir 1990;12:229-32, Drug Today 1989; 25:337-62, Med Oncol Tumor Pharmacother 1989;6:5-9). Soc 1991;50:263-74), vitamin E (JAMA 1997;277:1380-6) and zinc (Fed Proc 1986;45:1474-9). Extracts of Echinacea species contain polysaccharides, alkylamides/polyacetylenes and caffeic acid derivatives that have immune-stimulating effects such as stearateproliferation of natural killer cells and monocytes, activation of macrophages, and production of cytokines (Int J Immunopharmacol 1997;19:371-9; Immunpharmacol 1997;35:229-35; J Natl Cancer Inst 1989;81:669-75). 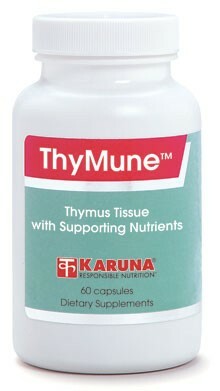 Suggested use for adults: 1-2 capsules daily on arising or before bed, or as directed.